International attendance has grown at US shows, but there is still a large segment of international customers who prefer to stay closer to home for trade shows. And many of those customers choose shows in the APAC region. Can any company afford to ignore the impact of the global economy? Not anymore. Perhaps some of these shows are already on your schedules, but if not, it’s time to give some serious thought to reaching out to the large APAC market. Will you be at ICSC’s RECon this month in Las Vegas? RECon is the fifteenth largest show in the U.S., but there is still part of the retail real estate market not in attendance. There is a large Asian market focused on retail real estate development, and representatives from these enterprises will be attending RECon Asia Pacific in Kuala Lumpur this September. Thinking about exhibiting? We can help. Security is a major concern in virtually every country in the world, with a record number of security breaches in the last year. Cybersecurity Ventures estimates by 2021, cybercrime damage will hit $6 trillion annually. 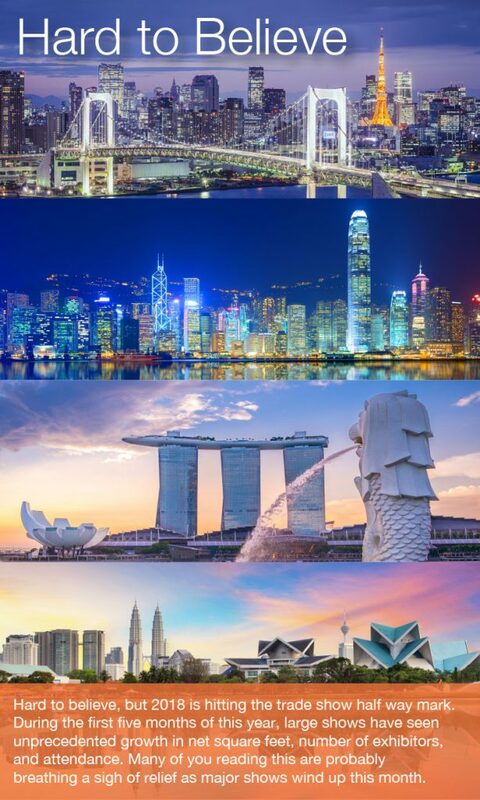 The US security show, RSA, just wrapped , attracting 42,000 attendees but RSA Asia Pacific and Japan is coming to Singapore in July and anticipating a large market presence. INTERPHEX, the source for complete biopharmaceutical manufacturing solutions, was held in April in New York, adding 90 new exhibitors to the 635 leading suppliers with exhibits on the show floor. Think that’s big? INTERPHEX JAPAN has a 30-year history as one of the most important annual meeting places for pharmaceutical industry leaders in Japan and Asia, gathering 1,510 exhibitors under one roof at the Tokyo Big Sight. We’re giving you just a sampling of shows that prove markets are global and no longer acknowledge geographical boundaries. Your show schedule needs to encompass the world. Are you not exhibiting outside North America because the prospect of transporting your program to another country is daunting? It needn’t be. Companies like ours, Idea International, will manage your logistics every step of the way, ensure your brand consistency, and manage your budget so you can focus on market expansion. Contact us now—we’ll be happy to help you find the right shows in your industry.